Our Treat! Topping sauces come in five delicious flavours, all available in a handy 600g bottle….. Milk Chocolate, Strawberry, Toffee and Raspberry. They are perfect drizzled over ice creams, waffles, pancakes and desserts and allow you to create low cost finishing touches to your entire dessert menu. All our Treat! 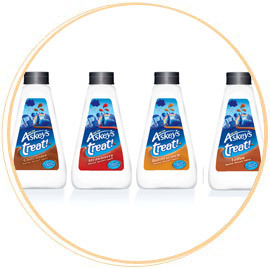 range are free from artificial colours, flavourings and preservatives! Yet they have a long shelf life and don’t need refrigerating!